At least eight people have been killed as inter-ethnic clashes spread across Kosovo in the worst violence in years. 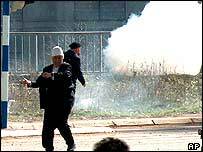 The troubles began in the divided town of Mitrovica in northern Kosovo, where Serbs and Albanians exchanged gunfire and grenades in clashes. Nearly 300 were injured, including 11 French peacekeepers - two seriously. Violence has spread to several towns, with Serbs' houses being set on fire and attacks on offices of the United Nations administration, Unmik. Tensions resurfaced in the flashpoint town of Mitrovica on Tuesday when three Albanian children drowned, allegedly as they were trying to escape from Serbs who chased them with a dog. The boys' deaths came a day after an 18-year-old Serb was wounded in a drive-by shooting in the village of Caglavica in central Kosovo, prompting clashes between Serbs and Nato peacekeepers. There has been widespread international condemnation of the riots. Kosovo Albanian leaders have urged their followers to call off their protests. Serbian Prime Minister Vojislav Kostunica said Wednesday's attacks showed the true nature of Albanian separatism, "its violent and terrorist character", and called for Kosovo Serbs to be given autonomy. in Lipljan, eastern Kosovo, four Serbs were reportedly killed, the Serbian news agency Beta said. There has been no independent confirmation of the report. Hundreds of Kosovo Albanians converged on the southern part of Mitrovica to vent their rage after the boys drowned in the Ibar River. Kosovo Serbs controlling the northern part also started gathering for the confrontation. Peacekeepers blocked off a bridge separating the Serbs and Albanians and fired tear gas, rubber bullets and stun grenades to keep the angry crowds apart. But as the Albanians tried to force their way across the bridge - and a second one - there were bursts of gunfire, and a reported grenade explosion. "I heard several bursts of gunfire, and then just felt pain and went down on the ground," said Ridvan Lahu, who suffered a gunshot wound. Six of the dead were Albanians, two Serbs. By the evening the situation had been brought under control by the hundreds of UN police and Nato peacekeepers and a curfew had been imposed. Kosovo's UN administrator Harri Holkeri called the violence a "black day" and with local leaders issued a statement calling for an immediate end to the violence. Mr Kostunica denounced the Albanian "onslaught on the remains of the Serb community" in Kosovo. Mitrovica has been a flashpoint since the UN took over the administration of Kosovo in 1999 after Nato air strikes forced a Serb withdrawal. 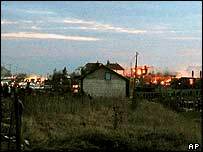 Around 200,000 Serbs left Kosovo, but some remained in isolated enclaves or more homogeneous blocs, like northern Mitrovica. Kosovo's future status is unresolved. Mr Kostunica recently proposed that the province be either divided into cantons or split on ethnic lines. That was immediately rejected by Mr Holkeri. On Wednesday, the Serbian prime minister said: "The Serb community in the province must have not just rights, but within these an autonomous area in which it will be able to protect these rights, in which it will feel safe". "Hospitals were overwhelmed by hundreds of wounded people"